Welcome to the home of Discoveries in Art ®. We specialize in Caribbean and Latin-American fine art, and particularly the works of Cuban Artists living both at home and abroad. Cuba is a land with a deep heritage of fascinating and diverse cultures. There is an explosion in progress in Cuba, an explosion of artistic talent and creativity. We are very pleased to show the work of a diverse group of talented artists and we are especially dedicated to bringing young and up-coming artists into the public eye. 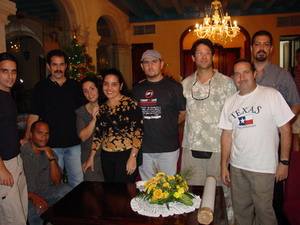 Most of our pieces have been purchased in Cuba from the artists. To showcase a broader selection of artists and styles, our site also includes some works which are not available for purchase . If you would like to talk about any of our artists, or are interested in information about any of the pieces you see, please contact us.